FAQ - Frequently Asked Questions - U.S. Constitution Week in Grand Lake, Colorado the Premier and First Constitution Week Celebration in America! Join us for "The Premier Constitution Week Celebration in America!" ??? FREQUENTLY ASKED QUESTIONS ? ? ? What Events are planned during Constitution Week and what is the cost to attend? Why do you have a Constitution Week? How do you find speakers? What lodging options are available in Grand Lake? Where is Grand Lake, Colorado? How can I donate or help with this event? What if my question was not addressed on this page? There are many events held during Constitution Week. Below is our newest 2017 Schedule. It begins Monday with a speech by a "Constitutional Expert", followed by a brief question and answer period. Events are planned everyday and will culminate on Saturday with the Parade down Grand Avenue, live Music, more Speakers, non-profit booths in the town park, Rotary Club Bingo, and the grand finish...an awe-inspiring fireworks show over the waters of Colorado's largest natural lake, Grand Lake. MOST of the "Constitution Week" EVENTS are "FREE" to the public; however we do have one FUND RAISER planned Thursday night (click here for more details). We do however, encourage and appreciate donations from YOU to help us with the costs associated with this event. Without our many SPONSORS this event would not be possible; please visit and support them whenever possible. Click Here - to visit our EVENTS page for the most UP TO DATE INFORMATION. Click Here - to DOWNLOAD a *.PDF version of the schedule below. EVENTS - The short answer is MAYBE. MOST of the "Constitution Week" EVENTS are "FREE" to the public; however we do have one FUND RAISER planned Friday night (click here for more details), yet the fire code in certain venues are such that we have limited seating, and thus you may be required to make a reservation so that we can plan accordingly to ensure everyone's safety. LODGING - The short answer is ABSOLUTELY. Interest continues to increase with this being our 5th year! Accomodations are filling up quickly. We suggest YOU book your trip TODAY! Constitution Week was the idea of Tom & Mary Goodfellow who own the Grand Escape Cottages at the end of the boardwalk in downtown Grand Lake, Colorado. This patriotic couple questioned why our Constitution Day was not celebrated like Independence Day. So, they concluded that this would be the perfect opportunity to draw attention to our nation's most important document and that it would be a good incentive for folks to come visit Grand Lake after Labor Day. As we prepare for the 5th year, we have identified some of the foremost experts on the US Constitution, including attorneys that actively fight cases on all levels, including the Supreme Court. We have PdD authors that have written extensively on the US Constitution and we have identifed certain PhD experts that teach Political Science at major universities. As we gain more experience, we have asked them who we should have as speakers. As a result, we have a some of the best educated, most knowledgable, and foremost experts on the U.S. Constitution speaking at our event. Come join us and be a part of our celebration honoring the US Constitution. Grand Lake has a variety of lodging options available. Grand Lake, Colorado is a unique mountain town that is nestled along the shores of Colorado's largest natural body of water and is surrounded on three sides by the Rocky Mountain National Park. Here you have a choice of accommodations that include a variety of inns, hotels, motels, cabin rentals, lodges, cottages, bed & breakfasts, resorts, ranches, condominiums, distinctive private residences and campgrounds. Accommodations fill up quickly. We suggest that YOU book YOUR trip TODAY! For more information about lodging, we suggest contacting the Grand Lake Chamber of Commerce at (800) 531-1019. Grand Lake, Colorado is a picturesque mountain town situated on the shores of Colorado's largest natural lake, both the town and lake share the same name and are located in north central Colorado. Grand Lake is NW of Denver on the west side of the Front Range and/or Continental Divide. It is a beautiful two (2) hour drive from downtown Denver (100 miles +/-) using I-70 and the famous Berthoud Pass or it is approximately a two and one-half (2 1/2) hour drive from Denver International Airport (126 miles +/-); weather and traffic permitting. Grand Lake is the Western gateway into the beautiful Rocky Mountain National Park and is located just east of the Arapahoe National Forest. Located high in the Rocky Mountains, Grand Lake is only forty-six (46) miles from Estes Park through the Rocky Mountain National Park via the famous Trail Ridge Road (Highway 34). (Please note: Trail Ridge Road is CLOSED in the winter.) Should you require more information about Grand Lake, it's events, or other points of interest, we suggest you contact the Grand Lake Chamber of Commerce at (800) 531-1019. All of the "Constitution Week Events" require energy, effort, and above all funding. While we are forever grateful to our current sponsors, we are always searching for additional help. Please contact the Grand Lake Chamber of Commerce at (800) 531-1019, if you are able to donate funds or your time, they will direct your inquiry to the appropriate person. 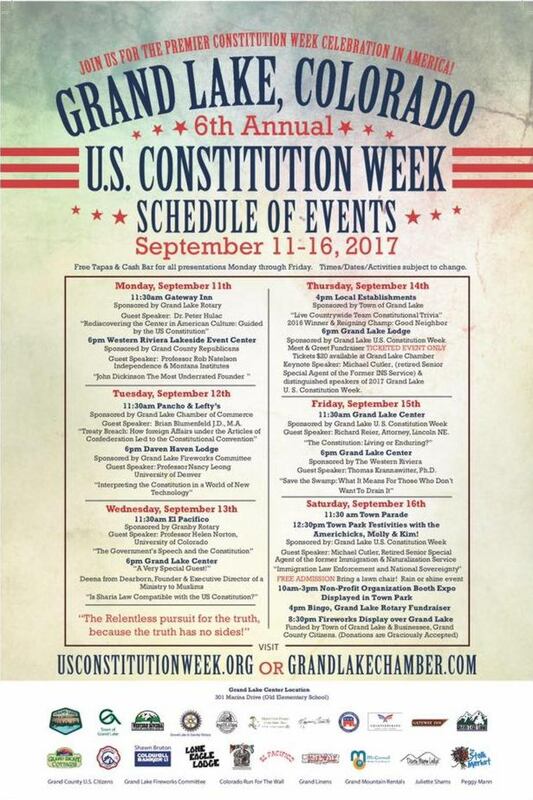 Should you have questions with regard to any of our "Constitution Week Events" that we have not answered here, or if you have other ideas or thoughts you would like to share with us, please do so through the Grand Lake Chamber of Commerce at (800) 531-1019. © 2015-2018 • www.usconstitutionweek.org • All rights reserved.